Whistle Haven joined our family earlier this week and has already captivated our hearts and dreams. This charming Cape Cod style home was originally built in 1979 and sits nestled on a spacious piece of land right next to the train tracks. Now that you are probably questioning if you are reading the MLS description or an actual blog post lets dig into the what, when, and why of it all. Whistle Haven is a foreclosure that had been on and off the market for around six months before we found her back in November. 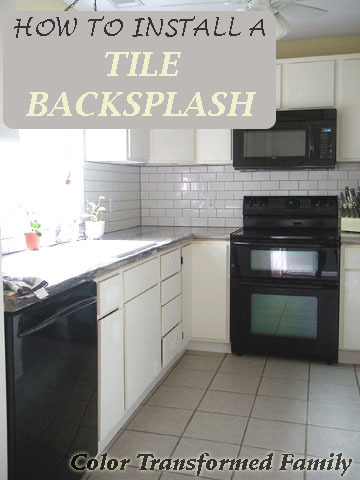 Everything inside of her still boasts 1979 and could scare the average home buyer away but from the beginning we saw past her outdated finishes and into the bones of a beautiful house that was just waiting to become a home for our family. 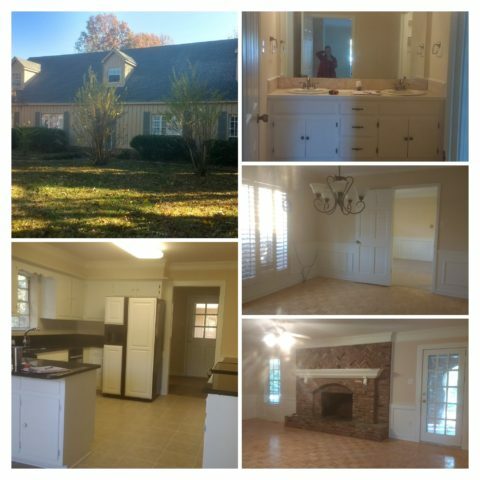 Michael Luke and I have always dreamed of finding an older home and fixing it up. 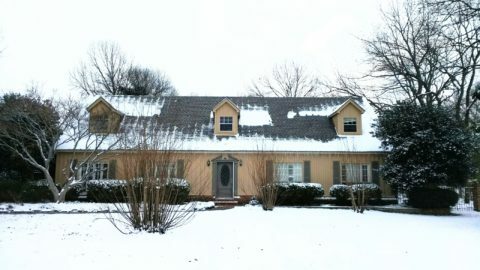 We are prepared to tackle this house like Chip and Joanna Gaines… minus the filming crew and shiplap, with plans to gut and transform the entire first floor of the house. Since Whistle Haven is a foreclosure she was priced a good bit under what we were open to spending on a house so that leaves us plenty of room in the budget to customize our dream house. Which means I’m having to give some serious thought into what’s the best kitchen layout for our family, what flooring and cabinets do I want to live with (for a while), and how much demolition do I need to do myself before I finally get those six pack of abs. Floor removal is a for real workout! Michael Luke and I had no real intentions of buying a house until we returned from China to bring Judah home. That had been our plan all along ever since we first moved to the Memphis area almost two years ago. Why? When we moved to Memphis we had already begun the adoption process so we had to update our homestudy and this ended up setting us back about three months… or more. The U.S. government has approved us to bring Judah home to his bedroom in this apartment. To bring him home anywhere else requires a complete homestudy update and resubmitting everything to immigration. Which is a big setback! Whistle Haven is perfect though because it will take us around two to three months to get all the renovations completed. During this time our apartment will remain our main dwelling space. We also plan to travel to China during this time as well. Once we return we will spend a little while at the apartment and then FINALLY make the big move to our new house as a party of five! I cannot wait. In the meantime Michael Luke and I will be tackling some of the demo and installation ourselves in addition to bringing in professional contractors, plumbers, and electricians to help us get this job done. The past few days while we’ve been working on things I’ve had the best time dreaming of what it will be like with all five of us living there. Wondering what secrets the girls will share with each other in their bedroom. Imagining Judah toddling around the house or our family gathering in the kitchen for family dinners while I cook. And picturing Emma chasing after countless squirrels. It’s going to be fun. Ever since we were newly weds… nearly ten years ago, we would drive around and look at houses. My favorite ones were always the older ones with character. Everyone’s dream or ideal house is different.. For some it’s a new home. For others a city apartment with a view. For me its always been an older home with character and a yard for a garden and room to play in. Whistle Haven posses all that. So why name our house Whistle Haven? A house is so much more than just a building and because of that it has always been my desire to have one with a name. I don’t feel like a house needs to look like Downton Abbey or the White House to earn a name. Every home should be entitled to its own name. My prayer for our house is for it to be a haven for our family but also our friends and guests that visit our home. This life is crazy busy but we all need a place for rest. To refuel. To recharge. We all need a haven. The “whistle” part of the name was easy. This house sits right beside one of the main tracks into Memphis so train whistles are no stranger to this house. The girls are beyond excited to have a view of the train tracks from their bedroom window and I’m reminded of the joy of watching trains when i was little. Not many people request hotel rooms next to the track… but we always did growing up because my sister and I loved watching the trains so much. So tell me, what’s the name for your home? Or if you haven’t named it yet what would be the most fitting name for your home? This entry was posted in Color, Home Improvement and tagged demolition, DIY, House remodel, Whistle Haven on 01/12/2017 by Krystle. Last week I shared updated progress pictures of our kitchen. One of the updates was new hardware for our cabinets. Installing the hardware was easy but I thought I would share a few tips that I used to make this easy upgrade super easy. 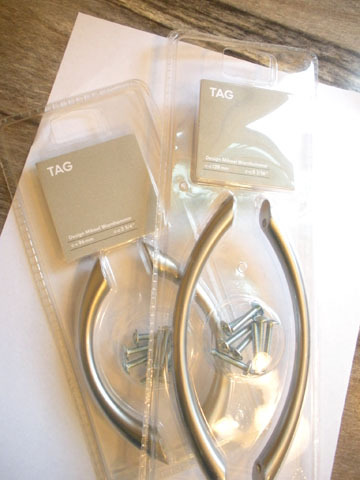 We bought these IKEA Tag door handles late last year in anticipation of finally getting this kitchen renovation tackled. IKEA is a Swedish company so I hoped the metric measurements would be more accurate. They were spot on. So the lesson of the day is: When dealing with a European company default to the metric measurements for accuracy. Now, back to the process of installing the hardware. 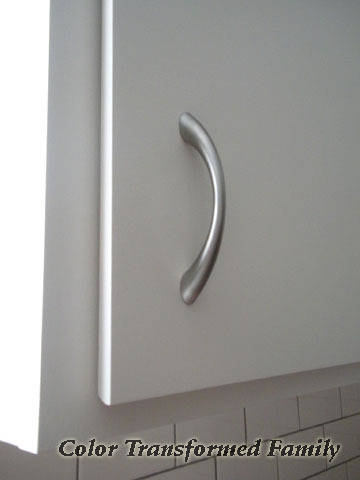 Placement of your handles is really up to you. 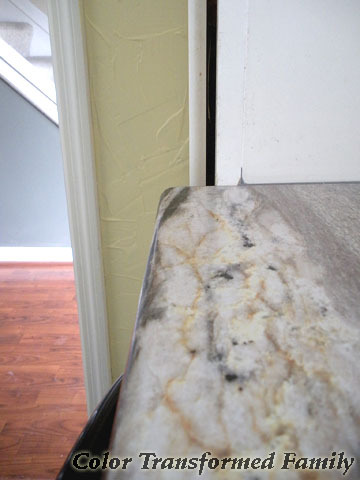 There are variables that can affect your placement… handle size, location of any trim on doors, and personal preference. So to figure out my preferred location of our handles I held a handle up to decide which location worked best for me. After deciding on a location I tilted the handle to the side and marked the location for the holes. Genius, right? Apparently I was really cold that dat because I am wearing my Columbia jacket inside! Those markings are not what I used to drill the holes though. First, I measured the distance from the holes to the side and bottom of the door and then adjusted to an easy to replicate measurement… for me 2 1/4″. Next, I made a template for easy and exact placement of all the holes on all the doors. I aligned the bottom corner of the paper with the corner of the doors and then made small pencil marks through tiny holes that I had previously punched to indicate the location for the screws. You may have noticed in the picture above that the center of the handle is also marked. This is important when marking the location on a drawer. I found it helpful to find the center of the drawers first and then mark the location of the holes. 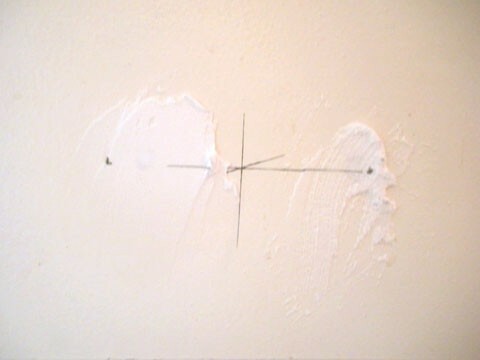 The previous picture also shows the spackling that I used to cover the holes from our previous hardware. The spacing on the IKEA Tag handles were a little bit wider than our previous handles but were easily hidden with some spackle and and sanding. Next, ML drilled the holes while I sat in the background nervously hoping that the measurements were right. After a few nail biting moments he assured me that the handle was installed without any trouble. Yay, for taking it slow and trying to get those measurements as accurate as possible. It truly was a battle against the non-perfectionist in me but it was completely worth it. Before installing all the handles I sanded and painted the doors and then FINALLY got to enjoy the beauty of my new handles. So, what nail biting tasks have you tackled lately? Do you struggle with being a perfectionist like me? Or maybe you struggle because you are a perfectionist. Sometimes ML’s perfectionism really gets on his nerves but it is who he is. 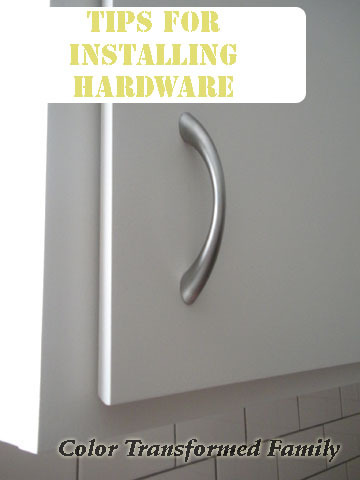 This entry was posted in DIY, Home Improvement, Kitchen and tagged hardware install tips, installing IKEA hardware, kitchen hardware tips on 06/18/2013 by Krystle. 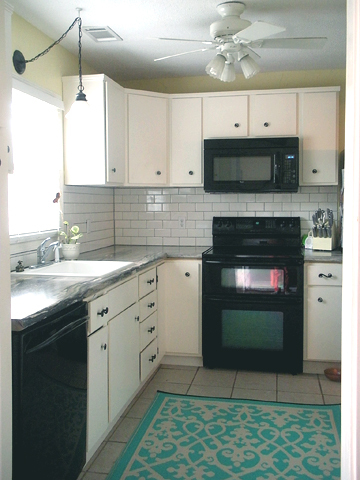 Installing our tile backsplash was a huge DIY step forward for Michael Luke. At first the idea of tackling such a major renovation task seemed daunting (see here)but with a little research and prep it proved to be rather easy and extremely rewarding. 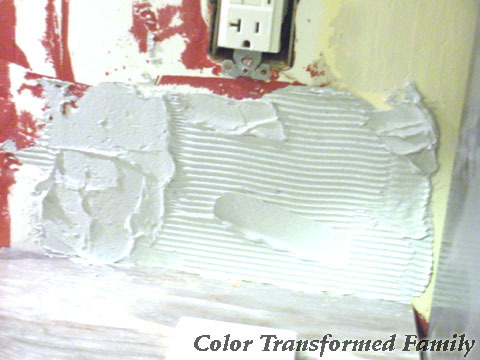 Sanding your walls isn’t something that needs to be done before every tile installation. But, in our case it was necessary. Why? Because somebody at some point or another in our house’s history decided to apply plaster all over our walls. Leaving it all lumpy and textured like this. So, we needed to get it smooth before we could move forward. 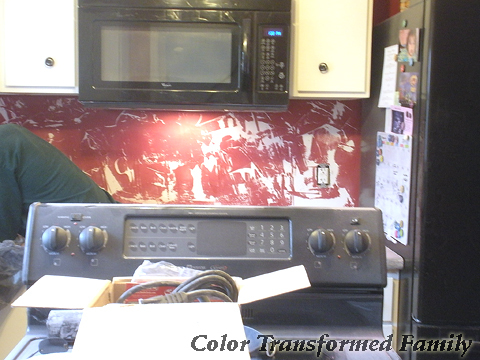 Michael Luke used our electric sander to smooth down the area where the backsplash was going to be installed. Cover anything you don’t want to get dusty or wipe down later and enclose the room you are working in with a dust partition. If not, you could possibly end up something like this. Just picture the dust above all over our entire house. It was not fun cleaning up. After, you finish sanding wipe down the wall with a damp cloth. To keep costs low we chose Tec Invision Ready To Use White Universal Adhesive as our mastic. 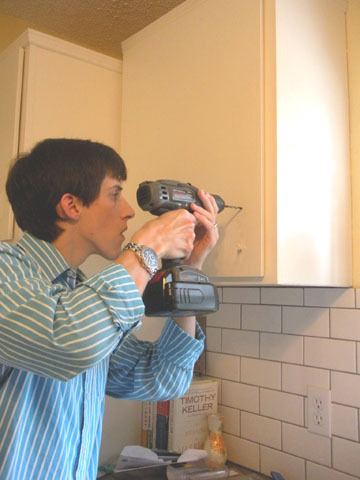 This method doesn’t require any special equipment that an amateur DIYer might not have. The only tool needed is a notched trowel to spread the mastic evenly and horizontally onto the wall once it is clean and dry. To determine which size notched trowel you need refer to the back of the mastic container. 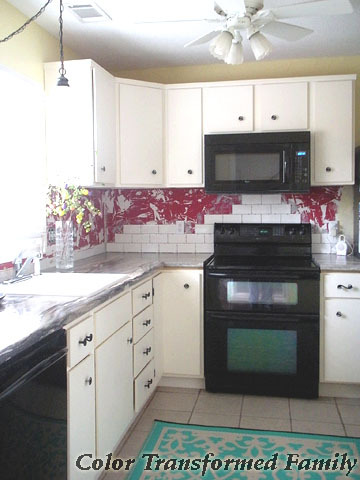 In our case we used a 3/16″ x 5/32″ trowel for 3″ x 6″ size tiles. 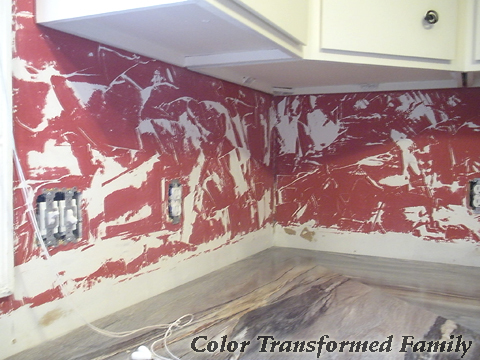 One gallon of mastic was enough to cover our entire backsplash area. Once a section of mastic is applied begin applying the tiles to the wall starting at the bottom and working up. 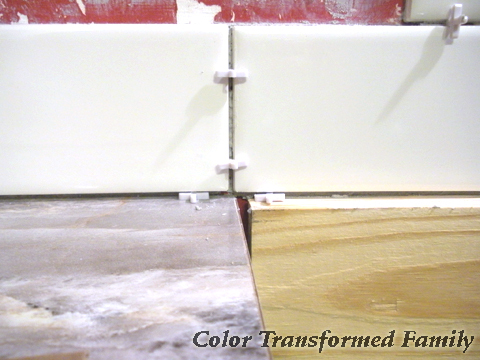 Before laying the first tile decide how you want the tiles to look. Do you want to start in the center and work out? Or start on one end and work to the other? For our installation we started on the end closest to the refrigerator and worked to the left. Centering the tiles would not have been noticeable on this wall. Spacers are used between tiles to keep them in place while the mastic dries. They are easy to pull out and are removed before grouting. 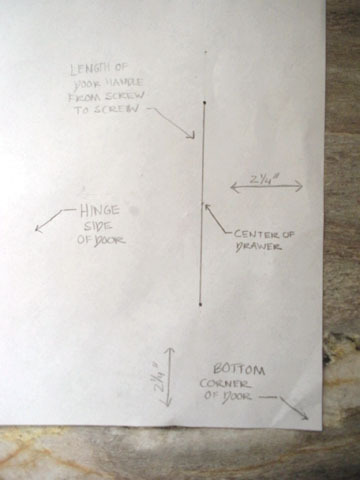 The size of your grout joint will depend on your tile size and grout type. 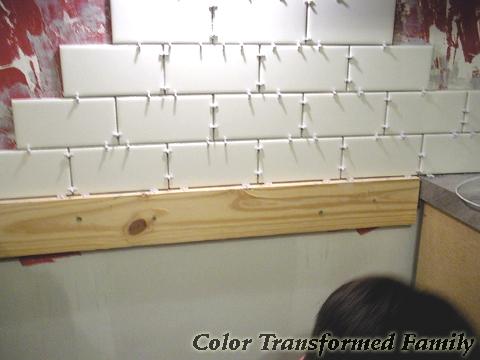 We used 1/8″ tile spacers. 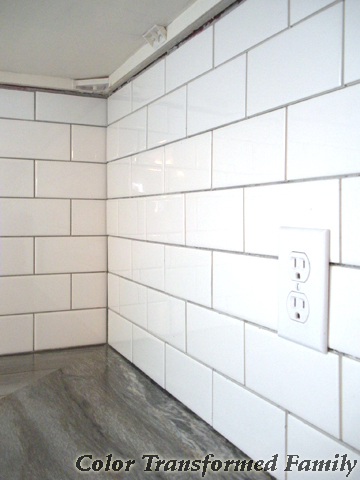 One of the biggest set backs in a tile installation is cutting tile to fit around electrical outlets and other areas. Tile can be cut with a wet saw or a hand tool. Michael Luke used the hand tool because we had one on hand and it was more cost effective than a wet saw. I’ll be back later this week detailing how it works. After your mastic has had time to dry and the spacers have been removed you are ready to grout. Refer to the mastic container for drying times. Drying time depends on tile size and mastic manufacturer. Like the mastic, we bought a ready to use mix, Tec Invision Read to Use Grout, in color Smoke Gray. This stuff is great because you don’t have to seal it and it its stain, mold, mildew, and water resistant. Applying it is super easy. 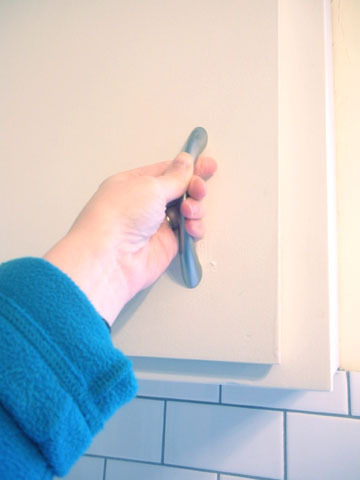 Spread liberally with a rubber trowel over tile and grout joints. Next scape the excess grout from the tile. Then, using a damp sponge pat the tile. Clean tile ad smooth joints working the sponge in a circular motion. Finally, drag a damp towel across surface to really make the tiles shine. 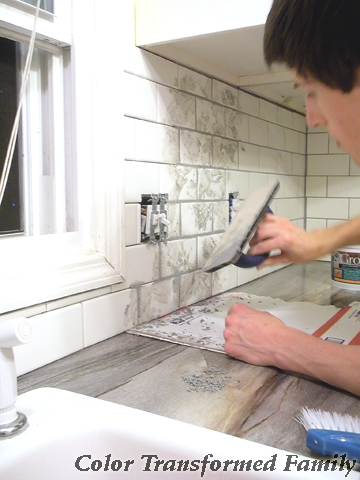 Don’t stress if you find some grout remaining after it has dried. It can still be removed from the tiles using a damp cloth and a little elbow grease. These six simple steps give you a beautiful tile installation that doesn’t break the budget… or your back! Have you ever attempted your own tile installation? Did you learn any tricks of the trade secrets? What was the hardest part for you? 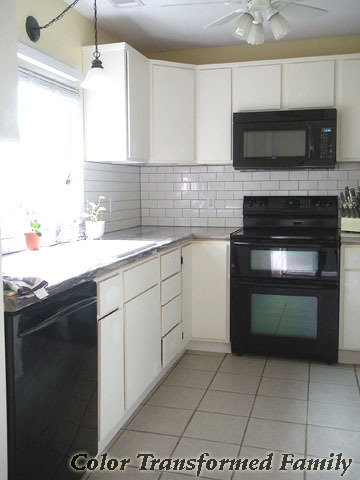 This entry was posted in Color, DIY, Home Improvement, Kitchen and tagged backsplash tile installation, easy tile installation, tile installation, tips for tile installation on 06/04/2013 by Krystle.